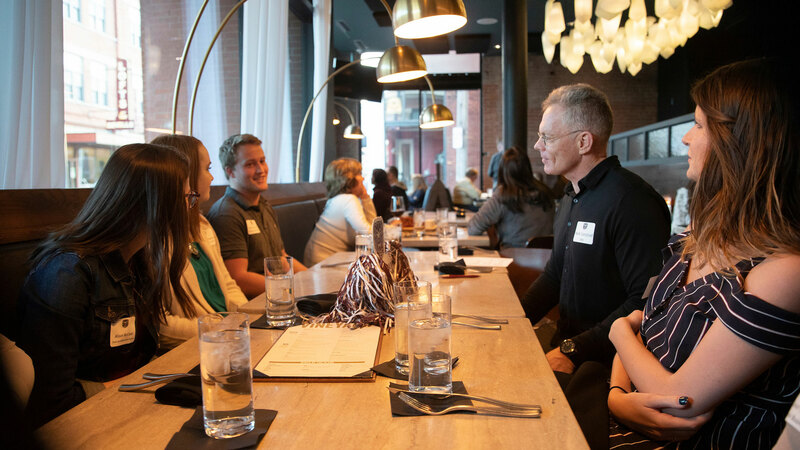 Mark Campbell, ’86, hosted a Dinner with Eight Bears event April 18 at The Order, the restaurant in downtown Springfield’s Hotel Vandivort. He and his student guests talked about everything from life on campus in the 1980s to which books had the most influence on their lives. Want to connect with students and easily give back to your alma mater? Be a host for a Dinner with Eight Bears! At these meals, current Bears network and learn about life after college. “Well, this is going to get heavy!” Campbell said with a laugh. 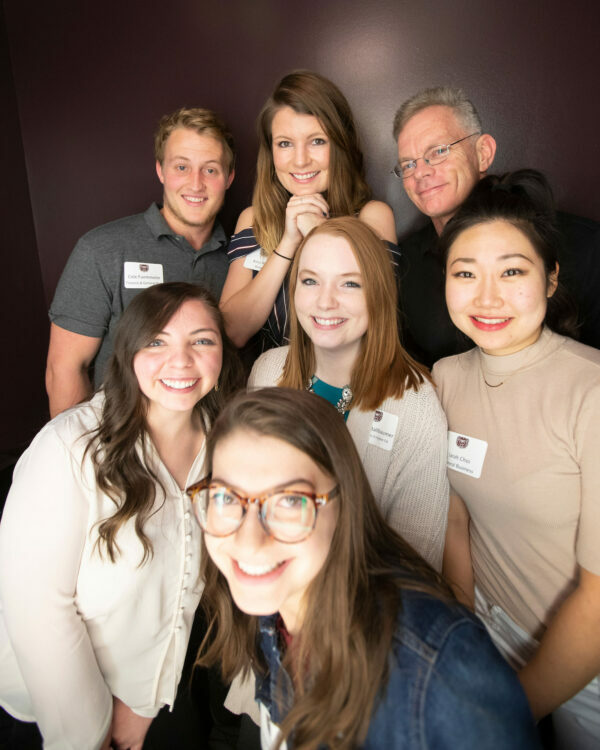 This was one of the opening discussions at an April 18, 2018, event called Dinner with Eight Bears, a new Missouri State program that pairs an alumnus host or set of co-hosts with current students. These gatherings offer networking and socializing opportunities for everyone involved. The hosts may share advice about careers and life; the students may share stories about current campus life and talk about their goals. Alumni are invited to host a dinner between April 3-17, 2019. Campbell is a 1986 graduate with a bachelor’s in finance and general business. He is a senior vice president and loan officer for First State Community Bank in Lebanon, Missouri. He heard about Dinner with Eight Bears from another alumnus. “When the opportunity came about to sign up to be a host, I jumped at the chance,” Campbell said. The students told him their future plans: Sarah Choi, a general business major, may work at her father’s trading company in South Korea. Anna Altice, a marketing/advertising and promotions major, is looking for an internship. Miranda O’Connell, a health services major, wants to earn a master’s degree in public health. Cole Fuemmeler, a finance and general business major, plans to start his own business. Be a better listener — let people talk about themselves. Respect everybody; never try to intimidate anybody. Give words of affirmation to others. Network as much as you can. Keep your life in balance. Learn to say no sometimes so you don’t miss out on time with family, or time you need for yourself. Campbell and the students took the traditional bathroom “selfie” at the Hotel Vandivort in Springfield. Melissa Stallbaumer is a 2016 alumna with a bachelor’s in public relations. She’s now a graduate student in the Student Affairs in Higher Education program. Stallbaumer is not likely to follow Campbell into a career in banking — but that wasn’t the point of the dinner, she said. The students said they enjoyed meeting an alumnus, and think this experience could help as they build a life away from campus. Want to host a Dinner with Eight Bears? The Alumni Association held a pilot program for Dinner with Eight Bears in Springfield during spring semester 2018. We’re now inviting all alumni to host a dinner between April 3-17, 2019. Dinners are held throughout the academic year. We’re now taking registration for dinners in spring semester 2019.
Who will come to my dinner? You get to decide many of the details, including the time, location, menu, topics of conversation and co-hosts. You can tailor your dinner to specific Bears, for example, first-generation students, nontraditional students, those involved in fraternity-sorority life, etc. You can also decide the number of students you want to host. Eight is just a suggestion — you decide what is comfortable for you. To ensure a good student-to-host ratio, we recommend you have at least one co-host, and that at least one of you be a Missouri State graduate. If you need help finding a co-host, we have alumni volunteers who would be happy to join you! Host(s) cover the cost of the meal; however, they may receive in-kind donation credit to Missouri State for the cost of providing the meal (receipts required). Michelle S. Rose is the writer/editor in the MSU office of editorial and design services. Michelle is the managing editor of Missouri State magazine and writes many feature stories for the publication.